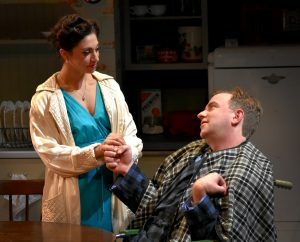 Every couple of years, Danny Eaton premieres a new play of his at the Majestic Theater, which he founded and leads. They range through topics dear to him, often touching on military service and veterans (he’s one himself) and all of them, in one way or another, asserting the importance of family, by blood or choice. It takes place during World War II in the small-town home of Walt and Alice Whipple – stand-ins for Eaton’s grandparents, though the line between history and fiction is unclear. After Pearl Harbor, three of the Whipple sons quickly joined up – Army, Navy, Air Corps – and just as quickly got married before shipping out, sending their brides to live with the in-laws. 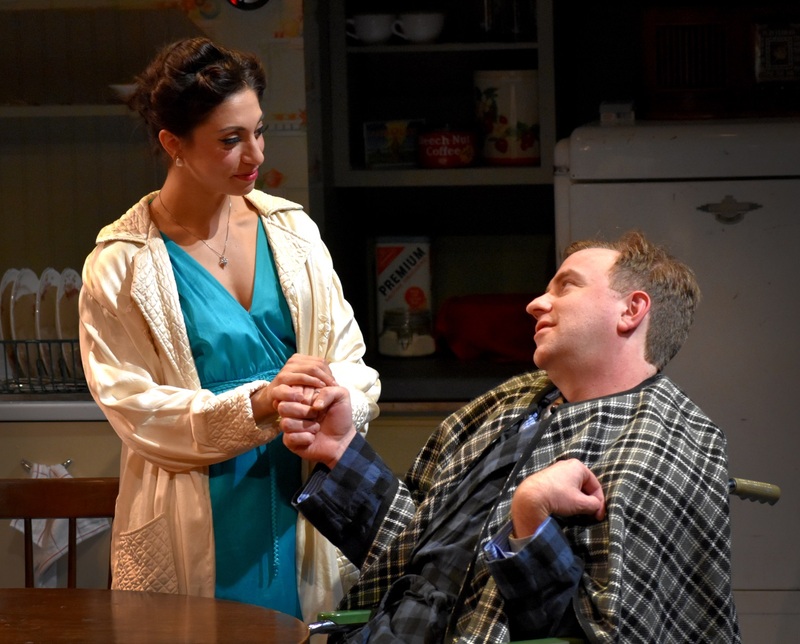 Greg Trochlil’s set depicts the kitchen, where the family hangs out, and the front porch, where curmudgeonly Walt sits and scowls (Daniel D. Rist’s lighting nicely limns the playing areas). 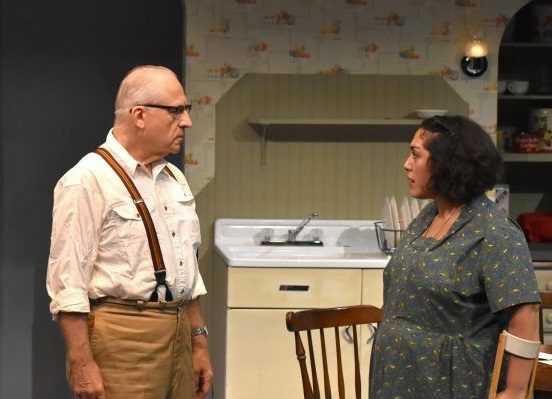 Ron Komora plays Walt with the truculent but bewildered air of a man who feels himself one step behind the changes in both the world and his family, and doesn’t want to catch up. 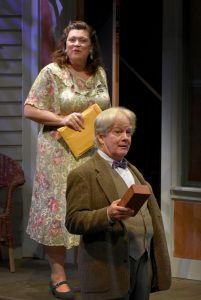 Though he’s the title character, his wife Alice is the central figure in the family circle, as open-hearted and accepting as he is prickly and private. Sue Dziura gives the matriarch a lovely solidity, a woman who holds everyone together with warm hugs, stern advice and strong coffee. Ted, the grown-up version of the youngest Whipple son, appears as our narrator, strolling onstage at regular intervals to observe and comment on the action. John Thomas Waite gives him the folksy geniality of the Stage Manager in Our Town. Christopher Rojas is the young Teddy, an adolescent mirror of his older self, eager to become a man and join his older brothers in the fight, but still gawky with girls. The 12 characters have intersecting stories, many of them involving wounds, whether seen or secret. One of the sons, Hank, has already come home, paralyzed and speechless (Tom Dahl’s performance, limited to grunts and gestures, is movingly expressive). Charlie, the upstairs lodger (an affecting Cliff Blake) hides a hideously burned face behind a veil. Ralph the postman (Mark Dean, sweet and sad) carries the hurt of his son’s death in combat along with his mailbag. As the play begins, two of the sons’ wives are already in residence – a major source of Walt’s grumpiness. 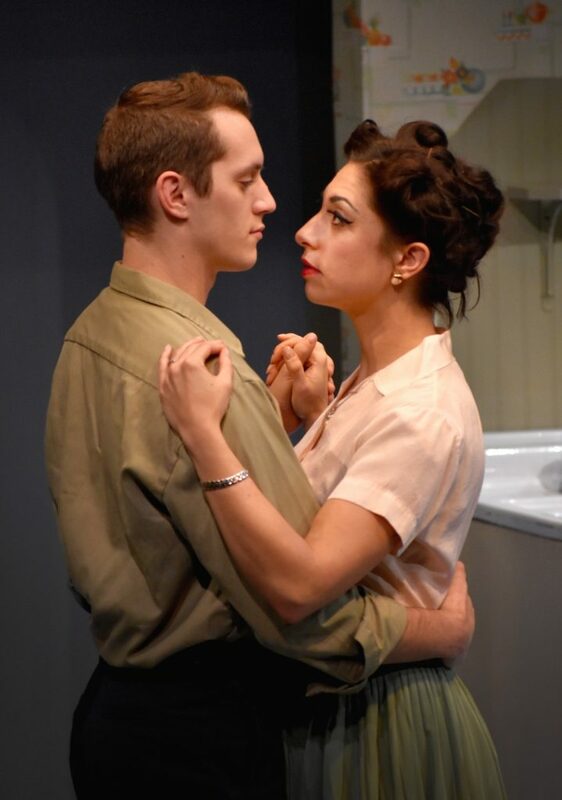 As Alice says, “He’ll be lucky to survive this war, with all of us women around.” Hank’s wife Amelia (Katie Mack) is loyal but itchy, while Irene (Jami Wilson) gamely swallows fears for her submariner husband’s safety. Neither of these women is very fleshed out, in contrast to the third son’s bride, Maya, whose arrival on the scene provides a triple surprise and provokes a crisis of conscience in the family –especially for Walt, whose war is within, a home-front battle with his own better angels. Without dishing any spoilers, I’ll say that Jordan Reed’s performance as Maya lives up to her character’s gutsy self-assurance. 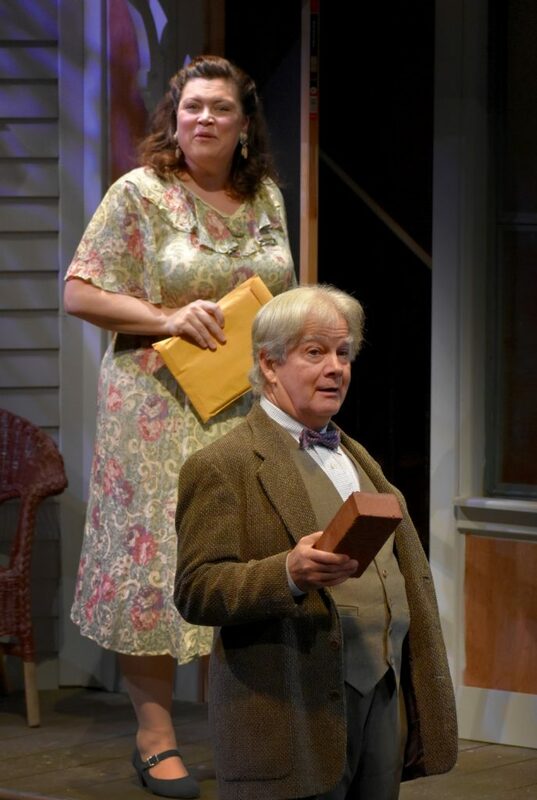 A dozen characters is more than most small companies could afford to put onstage, but the Majestic always has room for Eaton’s visions, and Walt Whipple is his own family’s story, so he’s made room for its multiple aspects and personalities. 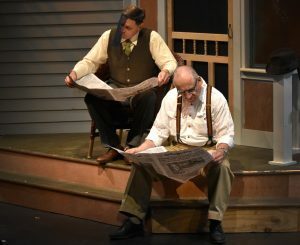 In a program note, he calls it “a warm and gentle play,” and so it is – not as dramatically taut as it could be, but touching, a sepia snapshot of “the greatest generation” sealed in a treasured scrapbook. The War and Walt Whipple runs through Dec. 9 at the Majestic Theater, West Springfield. (413) 747-7797, http://www.majestictheater.com.